The 2018-19 Artifacts Honoured Hopefuls Relics set is quite simply one of the best looking relic sets in recent memory. Of course, one needs to take some of the high-end sets into account from products like The Cup and Premier, but not every collector out there can just run down to their LCS and pick up a box of those products. 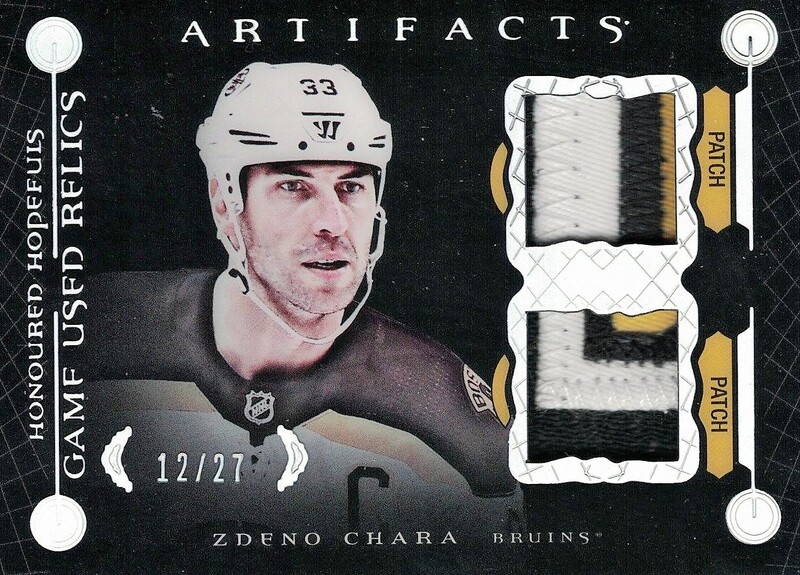 Artifacts, on the other hand, is a product that isn’t typically going to be priced out of range for hockey collectors who are looking to scratch that proverbial itch. The checklist is only 11 players long and is filled with names like Ovechkin, Malkin, Stamkos, and Bergeron, just to name a few. So, when you add those names to a limited print run of just 27 copies per, and the stunning contrast of the black background of the card against the silver overlays, you will start to understand why these tough pulls sell so well. The relic pieces themselves are nothing to be scoffed at either. Multicolored patches with stitching can be found throughout the print run as well as stick pieces that are bold and help define the subject pictured. In other words, these are not the plain white swatches found in your typical relic set, rather these pieces set the bar for what relic sets should look like. In a word: stunning. The Artifacts brand is an established one in the Hobby, so collectors know exactly the kind of content that can be found when they grab a pack or two, but finding one of these beauties has to be considered an added bonus for sure.